Ooh, I want monkey jammies! These are AWESOME! I'm changing right now. Thank you so much. Whooweeee!!! Look at what I just found! Brandi, I love the Snoopy avatars! Going to use one of them right now! THANK YOU! Great job as always...not just Snoopy...on the others, too!! Glad you like them, Puzzler. Thanks again. You're always beyond thoughtful. It's so appreciated. Also, have to say that the avatar for Boo - with the dog with hat is darling! These are great!! Thank you! If you ever have a request, feel free to ask! 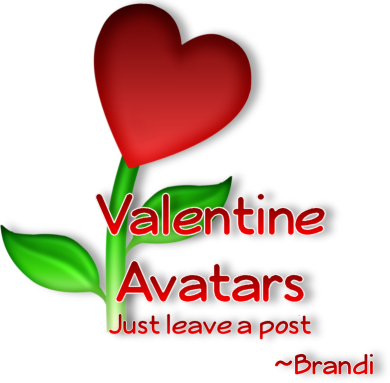 Want a Valentine avatar designed just for you? Just leave me a post! I just want you to know that you really made my day with your "pogo" monkey. I hadn't thought about the race for years and it brought back such good memories. Paul was a conservative Connecticut yankee and when his one eyebrow was raised so high it was starting down his back I knew it was time to rethink my plans. Opposites do attract. I am sure you miss Paul very much. I am so glad I could trigger a fun memory. Should I put duct tape on my red but*ts? Is it the right size for an avi? Much, much better than sarongs. Thanks, BRANDI! hope all has been well with you and yours! i have been so slammed been non stop sick i swear, and planning my wedding and trying to keep up with all the cases, whew!! I'll see what I can come up with for you wedding-wise. Do you want your baby monkey in it?? In the meantime, did you see your Valentine avatars? Page created in 8.213 seconds with 19 queries.